All types of boat fishing catered for, inshore, wreck, Reef & Trolling. We provide all the equipment you require for a good day out, good quality rods, reels and terminal tackle. 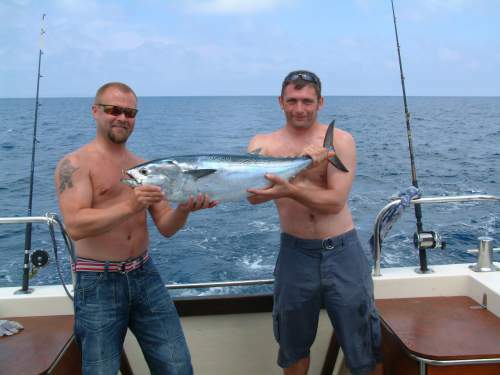 Bait is provided and with the experience of the skipper and the latest fish finding equipment. You can’t help but enjoy that day out. No matter what your experience we will help to give you a good day out. Depending on the time of the year and weather conditions, a wide variety of fish are available. Swordfish, Tuna, Shark, Grouper, Dorado, Skate, Bass, Gurnard, Sabre Fish, Bonito, Dolphin Fish, Dog Fish, Conger eel, Moray eels Squid and Octopus. There are some very large fish in the Mediterranean. If you take your angling seriously we travel up to 60 miles off when conditions allow, to hunt for Shark and Tuna over 300Kg. We fish the under sea mountain range (Full day trip) to get Grupa, Shark, Red and Black Bream and a variety of other species. 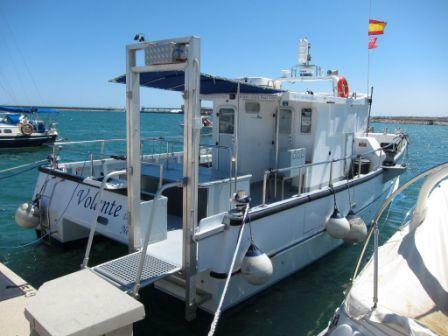 Boat leaves from secure marina in Torrevieja, with parking available. The Catch The Challenge of the catch. The Mediterranean shorelines are ideal for fishing. Many of the marinas provide everything required for a day of open sea fishing. 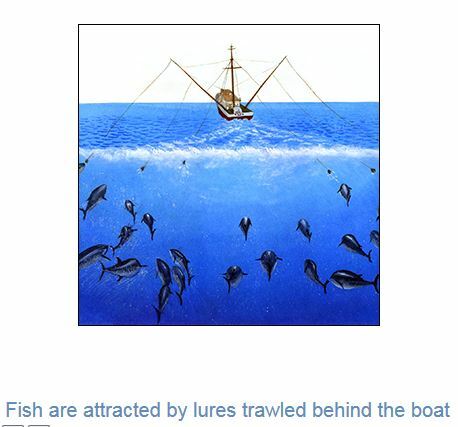 Swordfish fishing off Guardamar and Torrevieja are the most spectacular; it is immortalized in several feature films. 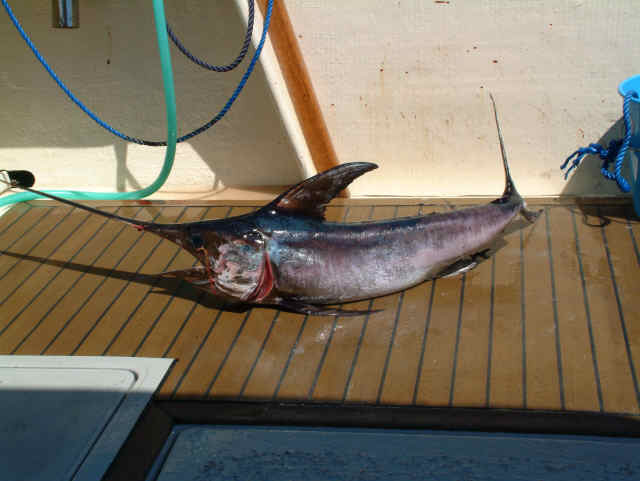 From July to September swordfish are found off the Mediterranean coast of Spain. There is also Tuna fishing in the open sea. The Tuna swim so near the surface in the summer that they become visible. The Tuna fishing grounds are fed by the commercial farms from Punta Calnegre and Cabo Tinoso. Likewise Frigate mackerel, Big Toothed Pampano, Blue fish, Sea Bass, Dorada, Amberjacks, Corvina, Gilthead, Grouper, Leer Fish, Barracuda, Moray and Conger Eels as well as some 150 types of shark provide good entertainment. Suitable for true enthusiasts or amateurs can also try their luck as well. Please tell us the dates you are looking for on this form. The Spanish have two different names for fish. When alive they are called ‘Peces’ and when they’re being served on a plate they’re referred to as ‘Pescado’. Here are a few species translations. Tuna – Atun. 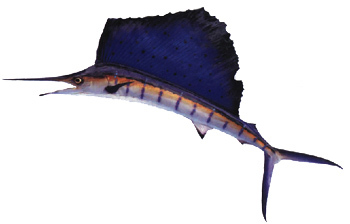 Marlin – Aguija. Mackerel – Caballa. Conger Eel – Congrio. Gilthead Bream – Dorada. Grouper – Mero. Moray Eel – Morena. Turbot – Rodaballo. Sardine – Sardina. Squid – Calamar. Upper body blue-gray with dark bars. Lower body silver with scattered dark blotches. Flat and big razor-sharp teeth, the longest teeth under the nose. Trolling natural baits (Mullet, Mackerel) or strip bait with or without plastic skirt. Deep trolling lures and minnows. Casting lures, poppers or minnows. Powerful first run followed by shorter runs near the surface. High flying jumper in shallow water. Upper body green or electric blue. Sides gold with flashes of green. The male has an upright head. Female has a rounded head. Dorsal fin runs almost full length of the body. The male is larger and heavier than the female. Trolling dead Mullet, Mackerel or Squid. Trolling strip baits, often in combination with plastic squid. Trolling smaller lures, konaheads, minnows and poppers. Drifting with small live bait, often with chum. Surface runs in combination with acrobatic jumps and direction changes. Upper body dark blue or black, lower sides can be golden and silvery belly. Sail and body spotted with light and dark blue spots. Verticalblue bands on upper body. Very high dorsal fin (highest in center), ‘V’-shaped tail and very long pelvic fins. Straight and slender lower jaw, and a long slender bill. Trolling strip bait, often in combination with plastic squid. Trolling or drifting live bait mullet or mackerel. Deep trolling baits or lures. A spectacular jumper with very fast surface run (Recorded 113 km/h). Upper body dark blue to black. Lower body silver with four to six long dark stripes. Trolling small lures, feathers, spoons and plastic squid. A fighter with fast runs. 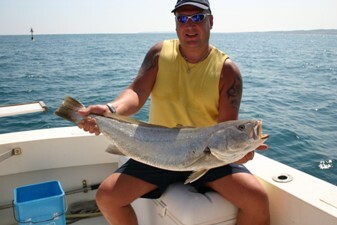 All types of boat fishing catered for, inshore, wreck, Reef & Trolling. We provide all the equipment you require for a good day out, good quality rods, reels, terminal tackle and bait. 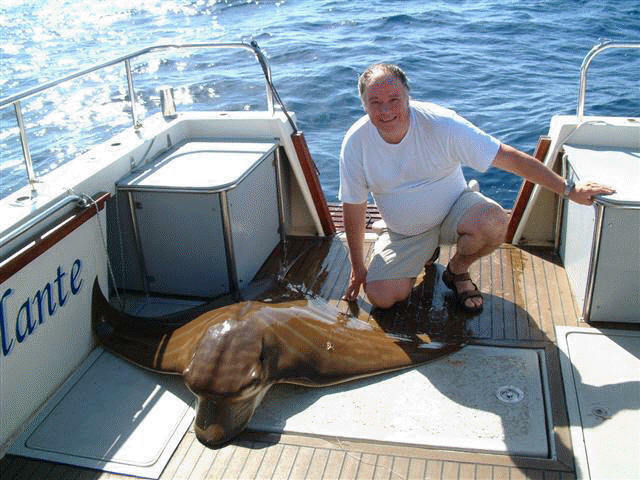 With the experience of the skipper and the latest fish finding equipment we aim to give you an enjoyable day. Swordfish, Tuna, Grouper, Dorado, Skate, Bass, Gurnard, Sabre Fish, Bonito, Dolphin Fish, Dog Fish, Conger eel, Moray eels Squid and Octopus. If you click in above you will find a good local selection from a local list of Hotels, Guest Houses, Apartments and Villas in the Torrevieja area of Spain. 5-2-11,24,24, photo size,49 ganew,33 rich,23.